Throughout the middle ages, the popularity of the Book of Psalms caused it to be reproduced in Latin as a separate volume of devotional literature called the Psalter. In medieval manuscripts, the opening phrase of Psalm 1, “Beatus vir,” was often richly decorated, as in this example from the thirteenth-century. 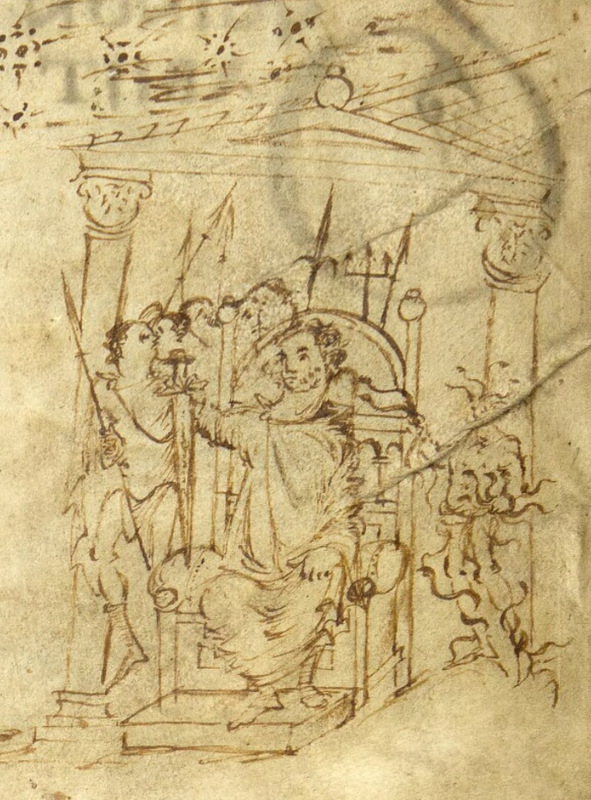 The university library in Utrecht preserves an early ninth-century manuscript of the Psalter, likely originating from the family of Charlemagne. 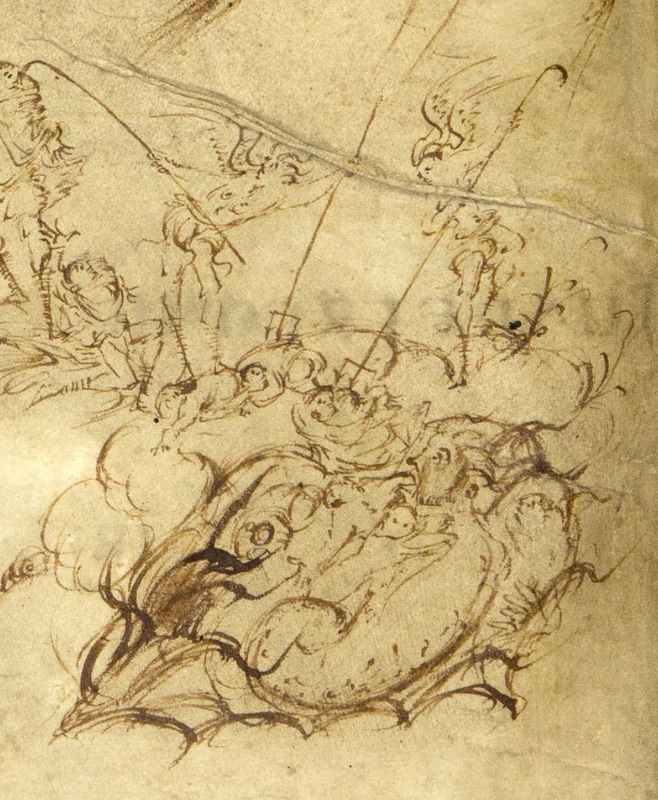 This rare volume, known today as the Utrecht Psalter, is unique in that it presents pen-drawing illustrations for each of the 150 psalms. It recently became available online, where it can be consulted in its entirety (http://bc.library.uu.nl/node/599). When I first saw the full-page illustration for Psalm 1, I was struck by a distinct sense of familiarity, even though this manuscript and its illustrations were completely new to me. Upon closer inspection and in reviewing its relationship to the text of the first Psalm, I noted a striking similarity to every family home evening, Sunday School lesson, and flannel board retelling of Lehi’s dream from 1 Nephi 8 in the Book of Mormon. Before showing the full-page illustration, here first is a consideration of the detailed sections, one portion at a time. In reviewing the elements of this illustration, I will cite the Douai-Reims translation into English of the Vulgate (Latin) Bible in order to remain faithful to the version of the Psalms that the scribes and artists of the Utrecht Psalter would have been familiar with. Psalm 1:2 But his will is in the law of the Lord, and on his law he shall meditate day and night. 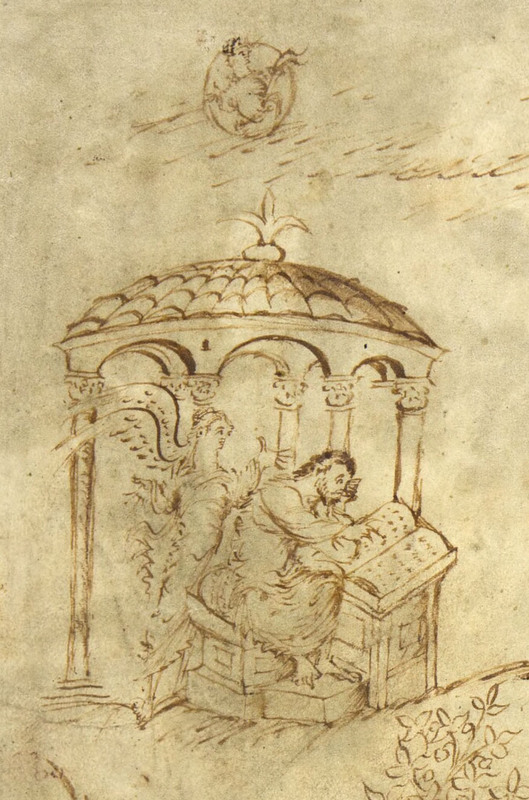 The happy man is depicted in a pavilion under sun, moon and stars, accompanied by an angel as he reads and contemplates the scriptures—perhaps the very Psalms that we are also reading. Psalm 1:1 Blessed is the man who hath not walked in the counsel of the ungodly, nor stood in the way of sinners, nor sat in the chair of pestilence. Psalm 1:3 And he shall be like a tree which is planted near the running waters, which shall bring forth its fruit, in due season. And his leaf shall not fall off: and all whatsoever he shall do shall prosper. From the perspective of Lehi’s dream, all that is missing from this river that leads to the tree and its sublime fruit is a path and a rod of iron (1 Ne 8:19-20). Psalm 1:4 Not so the wicked, not so: but like the dust, which the wind driveth from the face of the earth. Psalm 1:5 Therefore the wicked shall not rise again in judgment: nor sinners in the council of the just. In this part of the image, we can make out winged devils using their hooks and pitchforks to cast the wicked into the pit of Hell. Psalm 1:6 For the Lord knoweth the way of the just: and the way of the wicked shall perish. We might rightly ask how any similarity between Lehi’s dream and this ninth-century Psalm illustration could be anything more than coincidence. Yet, we know that Lehi had in his possession scriptures in the form of the brass plates. It is not unlikely that these plates contained the Psalms. We also know that one revelation can lead to another, just as Lehi’s dream became the springboard for Nephi’s far more expansive and detailed revelation (1 Ne 11-14). It seems possible to imagine, therefore, that Lehi, following an evening of meditation upon the first Psalm, received a clarifying revelation in the form of a dream. This purely speculative scenario offers a possible link between these two visually rich and thematically similar passages of scripture. Utrecht Psalter, Universiteitsbibliotheek Utrecht, HSS: Hs 32 dl 1-2 Con, fol. 1v. Dating from the ninth century, the Utrecht Psalter is the earliest surviving example of an illustration for Psalm 1, but other manuscripts in later centuries perpetuated and modified the same visual motifs, as in the following examples. The Harley Psalter dates from the first half of the eleventh century. 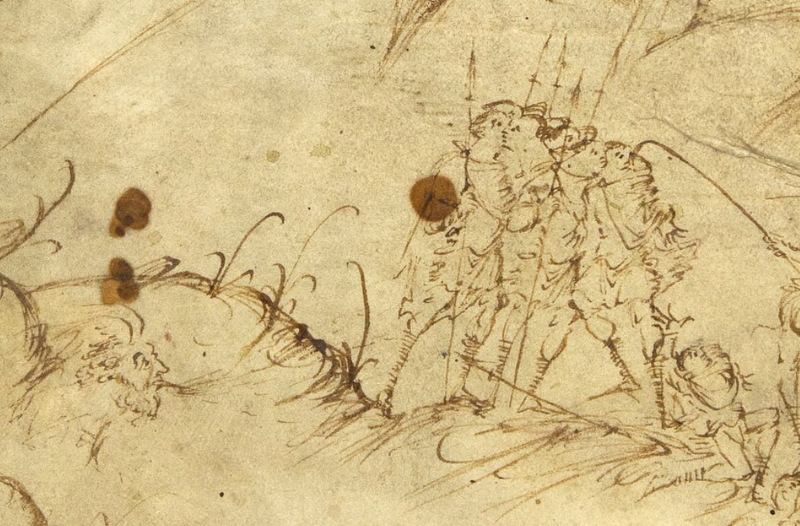 Its creators directly copied the illustrations of the Utrecht Psalter. Eadwin Psalter. http://sites.trin.cam.ac.uk/manuscripts/r_17_1/manuscript.php?fullpage=1 (scroll to f. 005v). Created in the twelfth century, the Eadwin Psalter provides Latin captions identifying each of the major characters in the illustration. In this late-twelfth-century interpretation, the “blessed man” is Christ. The top right square is the chair of pestilence. On the bottom left is the tree and the river. Between the panels is the wind. Notice how the style and interpretation have evolved from the ninth-century predecessor. There are hundreds of examples of the decorated phrase Beatus Vir. Here are a few of them. Bibliothèque nationale et universitaire de Strasbourg, Ms.5.522, fol. 26r. Bibliothèques d’Amiens métropole, Ms. 18, fol. 1v. Bibliothèque nationale de France, Département des Manuscrits, Français 13091, fol. 31r. Bibliothèque nationale de France, Département des manuscrits, Latin 11565, fol. 2r. Fun post; thanks for sharing. Thanks a lot Jesse, great images and commentary. Images and art plays such a subdued role in LDS worship, apart from maybe the temple mural tradition. Our scriptures are not illuminated, our chapels are quite sparse, the art hung in hallways and classrooms comes straight from the distribution center catalog. It seems like we could learn a thing or two from other traditions. Thanks for your responses! Dave, the association you make with Lord of the Rings is not too far off, given that Tolkien was a medievalist himself. Of course, the text here is Biblical, but there are many adventure stories in the middle ages that incorporate objects that have become named mythic adventures of their own. For example, Lancelot narrowly escapes the mortal dangers of the Perilous Bed in his original adventure story. The presence of art in worship has long been a matter of thought and discussion. 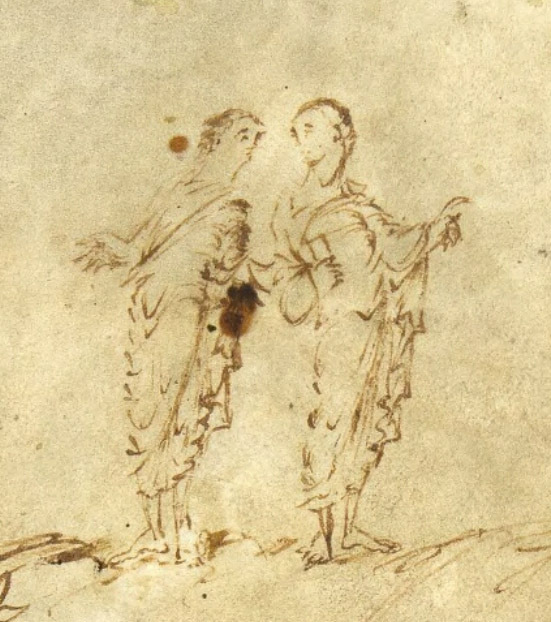 In the twelfth century, while Abbot Suger was promoting the use of art and beauty to guide the soul on an upward spiritual path, his contemporary, Saint Bernard of Clairvaux, worried that outward displays of visual delights so easily distract us from the inner accomplishments of the soul. The debate long predates these two historical thinkers. All I know for sure is that Arnold Friberg and Charlton Heston have irreparably influenced the way I read certain passages of scripture. Jesse, really enjoyed this. And love the serendipity of its coming just as I’ve started into I Ne 8 in my Reading Nephi series. Thanks, James. Your recent reflection on Lehi’s dream reminds us that his vision of light and hope emerges from a vast canvas of darkness. The implication of my piece is that his vision may not be cut from whole cloth. 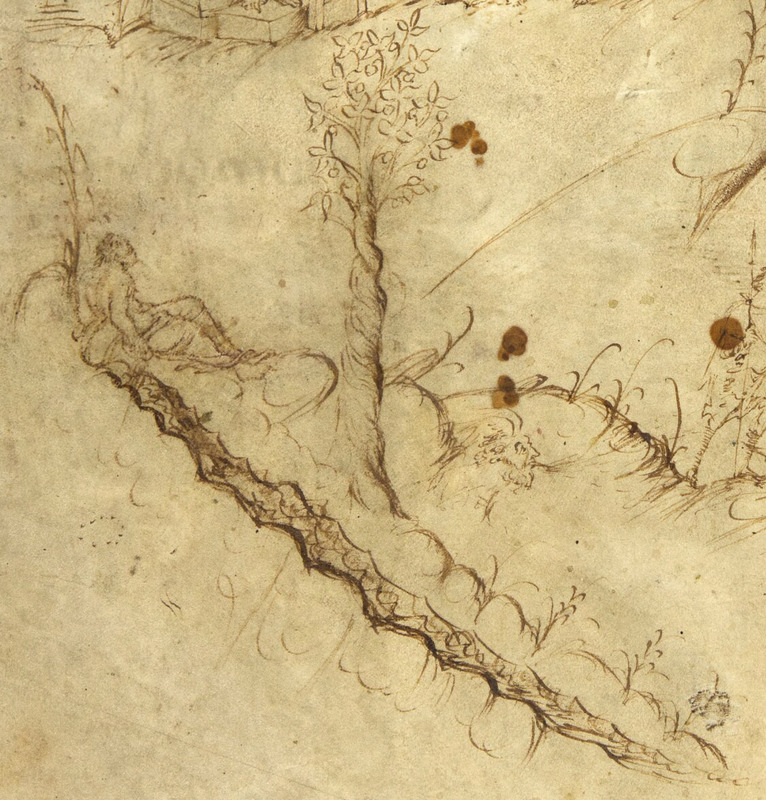 We might even extend the consideration of whether the author of Psalm 1 drew inspiration for the image of the tree by a river from some previous revelation. Lehi’s tree may have deep roots indeed. But apparently he was less concerned about distraction caused by the aural delights of song, as wasn’t he author of several hymns? Or at least the poetry associated with those hymns? Just as good art should have more place in our worship, so should good music. Sadly I believe the Mormon musical tradition has been atrophying for some time. ‘Your food,’ it is clear that Bernard did not shy away from expressing himself in the form of rhetorically rich textual meditation and praise. I believe, however, that all the musical settings for his words are much later compositions. Lovely, Jesse. Thanks for sharing. Love the post. I find it quite believable/probable that Lehi was given a dream in a structure he was familiar with. I like it a lot more than John W. Welch’s article in the Feb 2007 Ensign where he wrote about how the Prodigal Son is really a story about the plan of salvation, because he saw a stained glass window where the artist had used two stories which have a three act structure to create three scenes from each story. Meanwhile, more about stained glass in another post some day. If I remember correctly, John Welch’s article was not based only on a stained glass window, but also on actual interpretations by Church Fathers. That article was actually quite similar to this one (which I enjoyed quite a bit: thank you for it). IIRC. I liked John Welch’s piece as well as this one. jader3rd, please keep in mind that it was a step toward broadening Mormon vistas that Welch got a piece about medieval Catholic stained glass and Early Church Fathers published in the Ensign at all. And it was the Good Samaritan, not the prodigal son. This post encourages reflections. Thank you, Jesse, for telling me about it. It makes me think, in good ways. While researching for my Ph.D. years ago, I first had the chance — and often — to examine some medieval manuscripts of the Psalter which contain wondrously beautiful images of the Beatus Vir himself, in many vibrant forms. You remind me of their severally sonorous expressions. For example, the chance to see the 8th-century Corbie Psalter (your reference links directly to it: http://gallica.bnf.fr/ark:/12148/btv1b8452190t/f10.item) and to turn its pages remains wholly memorable. The beauty, creativity, and vivacity of its decorated initials continue to inspire. As a bonus, perhaps you would agree, was the amazing, serendipitous opportunity to examine the book, by choice of the library staff, at a table in the main reading room at which also sat the youngsters exclaiming over their reading of issues of ‘Asterix’ (https://en.wikipedia.org/wiki/Asterix“). The continuity over generations is powerfully resonant, and sometimes palpably visible at a single gathering in our presence, in our lifetime. It is remarkable how looking at the books can focus attention upon the texts, and the telling, that they mean to convey across the ages. Your post and the responses to it give nourishing food for thought. Thank you, indeed.